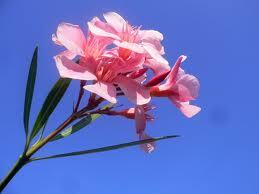 One of the common plants which is found especially in South India is Oleander. I have white, pink and red oleanders. When I tried buying a yellow Oleander for my garden, the vendors told me that it was "banned". I was really surprised to hear that and when I probed further, they informed me that the seeds and other parts of the Oleander, especially the Yellow variety is extremely poisonous. Its so difficult to believe that nature packages even dangers in such beauty. One can only keep admiring the tricks and trades of Nature. So, beware of such plants which are poisonous. If you have them in your garden, keep your kids and pets away from eating any of the parts of such plants. Amazing. Thatz really interesting info. The seeds from this plant is made into a paste and consumed for commuting suicide. This is the way it was done in age old days before the sleeping pills.In Tamil this is called Arali. However the flowers are commonly used in temples and the plant is commonly available in Tamil nadu.